The 140th running of the $2 million Kentucky Derby (G1) Presented by Yum! Brands was contested on a perfect Saturday afternoon at historic Churchill Downs in Louisville, with sunny skies and temperatures in the low 70's for the 164,906 paying spectators in attendance, the second largest in history, with a dry, fast main track. After Hoppertunity scratched on Thursday and also-eligible Pablo Del Monte on Friday, just 19 went to post in this 1 1/4 mile classic beneath the famous Twin Spires. California Chrome, winner of his last 4 starts including the San Felipe (G2) and Santa Anita Derby (G1) for trainer Art Sherman, was sent off as the 5-2 favorite. In to challenge him included 6-1 second choice Wicked Strong, winner of the Wood Memorial (G1) at Aqueduct for trainer James Jerkens, and 8-1 third choice Danza, winner of the Arkansas Derby (G1) and one of four entered by trainer Todd Pletcher. 9-1 fourth choice Candy Boy, third in the Santa Anita Derby after winning the Robert B. Lewis (G2) for trainer John Sadler, was the only other horse sent off at single digit odds. California Chrome leads down the stretch while chased by Danza (left). When the gate opened at 6:33pm, jockey Irad Ortiz Jr. sent 30-1 Uncle Sigh to the lead and he set opening fractions of 23.04 and 47.37 while pressed by 25-1 Chitu and favorite California Chrome to their outside. Down the backstretch, the pace battle continued through 3/4 in 1:11.80. Entering the stretch, jockey Victor Espinoza asked California Chrome for run and the favorite obliged, easing up to the lead at the 1/4 pole through 1 mile in 1:37.45. With the pacesetters dropping back, California Chrome opened up an insurmountable 5 length advantage at the 1/8 pole. 38-1 Commanding Curve, who was 18th early, and Danza, 9th early, put in late rallies that proved futile, as California Chrome ran past the finish post 1 3/4 lengths in front of Commanding Curve in a time of 2:03.66. It was another 1 1/4 lengths back to Danza third, and 2 3/4 lengths to the rest of the field led by fourth place finisher Wicked Strong. Left: California Chrome heads into the Kentucky Derby winner's circle as only the fourth California-bred Derby winner since Decidedly in 1962. Winning co-owner and breeder Steve Coburn, also celebrating his 61st birthday, said, "This is probably the best (birthday gift) so far. This horse just loves to run. To see this horse win the Kentucky Derby, I have no words right now, except we've got another California-bred to win the Kentucky Derby. To see all this happen, to see this dream come true, put up so much � your savings, your retirement � and see him win the Kentucky Derby, I have no words." 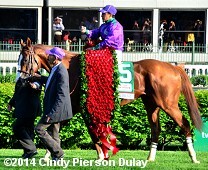 Right: California Chrome heads back to the barn with his new winner's blanket. 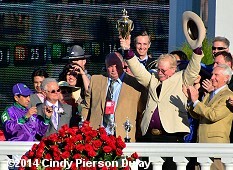 Trainer Art Sherman, now the oldest Derby winning trainer at age 77, said, "Just awesome. I'm breathless. This is so cool. I think I rode the horse with Victor the last 70 yards. It was a picture-perfect ride. He was right where he should have been all the way around. Coming down the stretch I was thinking: 'Keep rollin' big boy! Keep rollin'!' This has to be the sweetest moment of my life. To be my age and have something like this happen, what can you say? For all my friends in California, this is for you. We did it!" Left: California Chrome and Victor Espinoza on the turf course approaching the winner's circle. Espinoza said, "At the 3/8 pole I thought it was over. The others seemed to be struggling just a little bit. When we hit the head of the lane and I asked him, he put his head down and went on." Left: The trophy presentation. Coburn and Martin were offered $6 million for a 51% share in the horse, but declined. Coburn said, �We knew in our souls what kind of horse we had. This has been an incredible, incredible journey.� Coburn said that before the colt was born, he dreamed it would be a chestnut with four white feet and a big blaze, and that he would win the Derby. 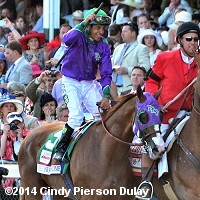 Right: Victor Espinoza celebrates after the race. He said, "Awesome. I never dreamed I'd win a second Kentucky Derby, but here it is. This was a typical race for him. He ran like he always does. Art just said: 'You know him, ride him.' I had the trip I wanted. I don't mess with him too much. I just stretch his legs and little bit and then let him do his thing. 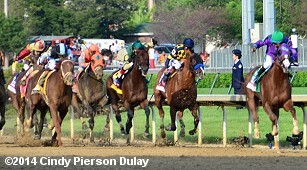 Pressure will be back on for the Preakness, but that's OK."
Soon after the start of the 140th Kentucky Derby. Jockey Irad Ortiz Jr. aboard pacesetter Uncle Sigh (yellow and purple silks at right) said, "He got to the lead and was going good, but he got tired." Trainer Gary Contessa added, "He got the lead and the pace wasn't fast. But he just got beat." 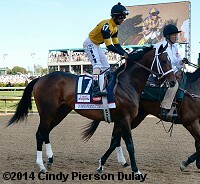 Left: Second place finisher Commanding Curve in the post parade. Trainer Dallas Stewart said, "I would never get frustrated over (training the runner-up 2 years in a row). There's a lot of things to be frustrated about. Getting beat in a horse race isn't one of them. He's a big, strong horse. You can see he handled the paddock real good. He handles a lot of things good. So, I doubt the race would knock him out. 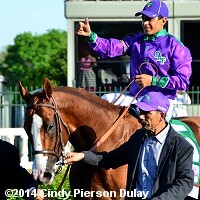 I was just hoping California Chrome would kind of give in a little bit, but he didn't." 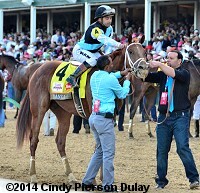 Jockey Shaun Bridgmohan added, "All I had to do was just ride him hard and he gave me everything. I was starting to get him geared up when he turned for home and I had half the field beat at that point. I just was looking somewhere for him to go. Once I got him down the lane, he lengthened his stride and really dug in for me." Right: Third place finisher Danza being unsaddled after the race. Jockey Joe Bravo said, "Really nice the first turn, I had everything good, but turning for home I had to wheel out and go around horses, but he kept kicking, Todd knows how to get them to the big game." Trainer Todd Pletcher added, "I thought he ran well. Coming by the wire first time, he got bumped by Vinceremos. But he got back in position and started to respond. Joe had to move him a little earlier than he wanted to. Considering that this was only the fifth race of his life, you've got to say it was a very good effort." Tonalist upsets in the Belmont Stakes - He just got up to beat pacesetter Commissioner by a head with Medal Count third at Belmont Park on Saturday. 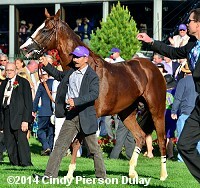 Heavy favorite California Chrome had a bad start finished in a dead heat for 4th with Wicked Strong. Get the results, chart, and photos here. True North Stakes and Belmont Gold Cup - Friday before the Belmont Stakes was headlined by the True North Stakes (G2) won by Palace along with the first running of the 2 mile Belmont Gold Cup won by Charming Kitten. Get the results, charts, and photos here. Belmont Stakes Friday Photos - Photos from the morning works on the Friday before the 2014 Belmont Stakes, including California Chrome, Commanding Curve, Tonalist, and Ride On Curlin. 2014 Belmont Entries - A field of 11 was entered with California Chrome the favorite at 3-5 breaking form post 2. Check out the horses with post positions, morning line odds, full profiles and free past performances here. Belmont Stakes Workout Photos - Photos from the morning works on the Saturday before the 2014 Belmont Stakes, featuring Triple Crown hopeful California Chrome in his final timed work before the big race. Also out were Commanding Curve, Tonalist, and Ride On Curlin. Analyzing the Belmont Stakes Contenders - My annual analysis using popular angles and statistical trends to see who best matches the profile of a Belmont winner. California Chrome is not alone on top! California Chrome romps in the Preakness (G1) - He took charge in the stretch and won by 1 1/2 lengths over late closing Ride On Curlin on Saturday at Pimlico with Social Inclusion 6 1/2 lengths farther back in third. Get the results, chart, and photos here. Preakness Undercard Stakes Results - There were 7 other stakes on Preakness day including the Dixie (G2) won by Utley and the Gallorette Handicap (G3) won by Somali Lemonade. Get the results, charts, and photos for all 7 races here. Stopchargingmaria wins the Black-Eyed Susan - Stopchargingmaria duelled with Vero Amore down the stretch and won by a neck in the Black-Eyed Susan Stakes (G2) on Friday at Pimlico with Fortune Pearl third and favorite Sloane Square 9th. On the undercard, Revolutionary won the Pimlico Special (G3). Get the results, charts, and photos for all the stakes on the card here. 2014 Preakness Thursday Photos - Nine of the 10 Preakness entrants are at the Pimlico stakes barn and most of them went out on a foggy Thursday morning. Check out photos for each here. 2014 Preakness Entries - A field of 10 was entered on Wednesday with Derby winner California Chrome the 3-5 favorite drawing post 3. Check out the horses with post positions, morning line odds, and free past performances here. 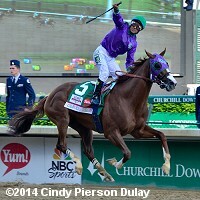 California Chrome wins the Kentucky Derby - California Chrome stalked the pace then took the lead after a mile and drew off to win the Kentucky Derby (G1) by 1 3/4 lengths over longshot Commanding Curve and Damza. Get the results, charts, and photos here. Thursday Kentucky Derby Photos - Photos of and notes for 16 Derby horses and 9 Oaks fillies from Thursday. Wednesday Kentucky Derby Photos - Photos of and notes for 15 Derby horses and 10 Oaks fillies from Wednesday. 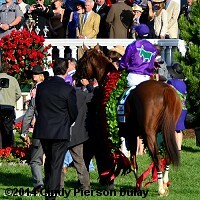 Tuesday Kentucky Derby Photos - Photos of and notes for 13 Derby horses and 10 Oaks fillies from Tuesday. 2014 Kentucky Oaks Entries - A field of 13 was entered with Untapable the 4-5 favorite from post 13. Analyzing the Top Derby Contenders - My annual analysis of the top contenders to try and select a winner by matching each to the profile of a Kentucky Derby winner using many of the more popular angles and statistical trends. Analyzing the Kentucky Derby Contenders - Trying to pick a winner using angles, statistics, and profiles. Who do you think scored best? Road to the Kentucky Derby Leaderboard - the points earned by contenders in these designated prep races are what will determine who gets in the Kentucky Derby and Oaks at entry time this year. Updated weekly. Triple Crown Trail - 2014 prep race schedule with results updated weekly. 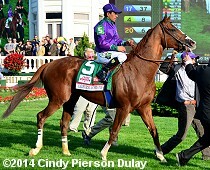 Review: Triple Crown Handicapper 2014 - by Jim Mazur. Includes lots of stats for all 3 races and explains how to use a system of statistically derived negative angles to eliminate the bad picks. Revamped for 2014 to new format with additional info. Security still tight for 2014 - if you are going to the Derby or Oaks be sure to check here to find out what you can bring in with you. The enhanced security from last year is back again so no big cameras, camcorders, big purses, or coolers. Check here to make sure you don't bring anything they will confiscate. Kentucky Derby Future Wager - This year there were 4 pools starting in November of 2013 plus a single pool for the Oaks. Surprisingly, thie field of all other 3-year-olds was the favorite in all 4 pools. 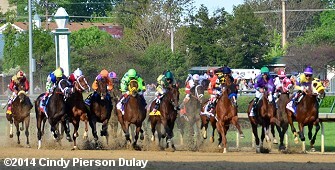 2013 Triple Crown Recap - all 2013 Kentucky Derby, Preakness, and Belmont articles including results and photos for all 3 races.